Most people agree that recycling is an important part of everyday life. Many cities and towns offer recycling programs and most individuals understand the need to recycle and do so in their homes. However, not enough offices and other workplaces have embraced the idea of recycling. If you would like to start a recycling program at your place of work, this article features tips that will help you get started. There are many benefits associated with recycling. Not only will recycling help to save resources, but also works to reduce waste and cut down on energy consumption. Paper recycling alone will help to reduce 40% of the energy required to make a new product out of raw materials. The average office worker – just one worker in one office – uses approximately 10,000 sheets of paper each year. So just imagine all of the waste and resources that could be saved in your office. Think about the number of shipping boxes that come into the mail room – most of these are recyclable. What about your lunch room? All the cans, bottles, plastic utensils and other items – most of these are fully recyclable as well. At home or at work – there’s much more we could all be doing with regard to recycling. Every program needs a program coordinator. Someone from your office – maybe even you – who has a genuine interest in recycling and a knack for organization would be a good choice. The next step is to contact your local recycling company to find out what types of collection containers or bins are available for use in your office. It is a good idea to monitor the waste in your office for a couple of weeks so you can evaluate how much trash is generated and how much of that trash recyclable. The recyclables found in most offices will primarily be paper-based in the form of office papers, shredded paper, cardboard, etc. It is important that you know your office staff and how much or how little they would be willing to participate. In some cases, a single mixed container that collects paper in the office will work best to avoid confusion, even if the recycling company pays more for materials that are separated – white paper in one bin, colored paper in another. However, if your team is on board with the idea of recycling, they might embrace the use of separate bins. In the break or lunchroom you will likely need a couple of bins to collect paper, plastic and aluminum products separately. Again, knowing the attitudes and level of support that you have from your staff will help you decide what type of containers will work best. Always check with your local recycling company to find out what restrictions, if any, they might have regarding recycled materials. Depending upon the amount of recycled material your office generates, you might be able to get commercial pick-up or you may have to round up volunteers to drop off the recyclable materials on a regular basis. The best way to start a recycling program at your workplace is to hold a meeting and talk with employees about it. Be clear with the rules of the program and make sure that everyone in your office receives a written memo as follow-up to the discussion. Contact employees via email or in person to make sure that they understand the importance of keeping the recyclable items clean for processing. Explain about items that cannot be recycled, such as pizza boxes and some cardboard food containers. Post the rules in the break or lunchroom so they can be easily seen and observed. Make sure that your recycling program is user-friendly. 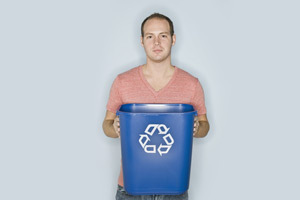 Choose recycling bins that are easy to find and conveniently place them where your employees will use them most. If you are recycling large items like cardboard shipping boxes that need to be broken down, make sure to keep a couple sets of safe box cutters available to make the job easier. Your mail room or shipping department will likely already have these tools available, but it is still a good idea to keep some near the recycling bin. If your office or workplace is located in the Southern New England area, contact Mid-City Scrap toll-free at 1-800-334-4789 or call locally at 1-508-675-7831 for information about the commercial and industrial recycling programs. Ask about containers, pick-up or drop-off options and any local recycling requirements or guidelines. Mid-City will even send a professional representative out to your location to see your work environment and suggest ideas that will help to increase employee recycling habits, reduce waste costs and boost your recycling revenue.